The Ambassadors Theatre London, and the St Martin's Theatre were conceived by their architect, W.G.R. Sprague, as companions, born at the same time in 1913, but World War I interrupted the construction of the latter for three years. The Ambassadors was built with the intention of being an intimate, smaller theatre and is situated opposite the renowned restaurant The Ivy, favourite haunt of the theatrical elite. The auditorium is decorated in an elegant Louis XVI style and the horseshoe shaped single balcony is only a few steps up from ground level, while the stalls are built underground. Charles B Cochran recognised the Ambassadors lent itself perfectly to intimate revue and a period of sophisticated 'miniature revues' were performed at the Ambassadors at the beginning of the First World War. The world's longest running and most famous play, The Mousetrap, started its run at The Ambassadors Theater, with Richard Attenborough and his wife Sheila Sim, who were the first of generations of casts to perform in what has become a seemingly permanent tourist attraction. Since The Mousetrap, The Ambassadors has enjoyed numerous other successes, including the Royal Shakespeare's hit production of Les Liaisons Dangereuses in the 80s. ATG took over The Ambassadors and it became the home for new writing. In 2007, it was announced that ATG had sold the venue to Sir Stephen Waley-Cohen, who began an extensive programme of refurbishments. You are invited to a ‘truly virtuosic performance... a masterclass’ with Judy Garland, Patsy Cline, Edith Piaf, Billie Holiday and Maria Callas. On stage for 90 minutes accompanied by live musicians and ‘performed with astounding versatility’ (★★★★ The Reviews Hub), Bernadette Robinson’s miraculous voice shifts from the smoky blues of Billie Holiday to the thrilling soprano of Maria Callas, via Garland, Cline and Piaf. With consummate ease, she breathes new life into the five legendary performers and the five ordinary women whose lives were changed by their brush with fame. This ‘tour de force’ (★★★★★ Broadway World), performed by the uniquely talented Australian singer and actor in her critically-acclaimed one-woman performance of a lifetime, is ‘a fabulous story’ (★★★★ The Times). 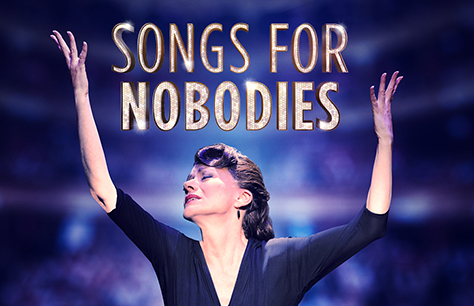 Returning due to phenomenal demand, Songs For Nobodies transfers to the West End’s Ambassadors Theatre for a strictly limited engagement from 9th January. BOOK NOW for a ‘spellbinding solo performance’ (★★★★ WhatsOnStage).